My wife purchased me a Drivers experience at the Pocono Raceway park in PA. We drove up there with my Son. They had 6 killer cars to drive on the road course. I got to drive the Corvette Z06 which is a beast. You drive with a road course instructor for 4 laps. The first lap you learn about the course. The next lap you push it a bit harder, 3rd lap it's all out and the 4th is a car cool down moderate pushing the car. It was so much fun but the funny thing about this is the instructor made many comments on my driving skills. The one that stuck out the most was when he said" your one of those 1/4 mile racers aren't you?". I laughed and said" how did you guess that?". He said " your all or nothing on the throttle you cut out throttle in turns and S turns then Full throttle out of the gate and down the stretch like a bat out of hell". LOL He was trying to teach me the art of throttle using some here and there and then rolling the gas when you come out of a turn and into a straight away. NAH I like full throttle aut of the turn and if the back end gets squarely I'll back off as needed. The tires on the Z06 where Street Slicks and stuck al over that track and I pushed it pretty hard as he would allow me. I scared him a few times as I can be very aggressive. I use to have a BMW years ago that I would love to go into on or off ramps like a bat out of hell or a killer back road and damn near on 2 wheels. I drove that Z06 not to it's limits but to my instructors LOL. Durangutan, DurangoUnchained, RangoLimited and 1 others like this. was that with sre or bertil roos? You got me here is a pic. It was a Exotic Driving experience. I was worried about that on the drive up there as it was raining. I'm in lower bucks county PA just north of Philadelphia. C7 Z06 with the Z07 package - pretty awesome on the track. 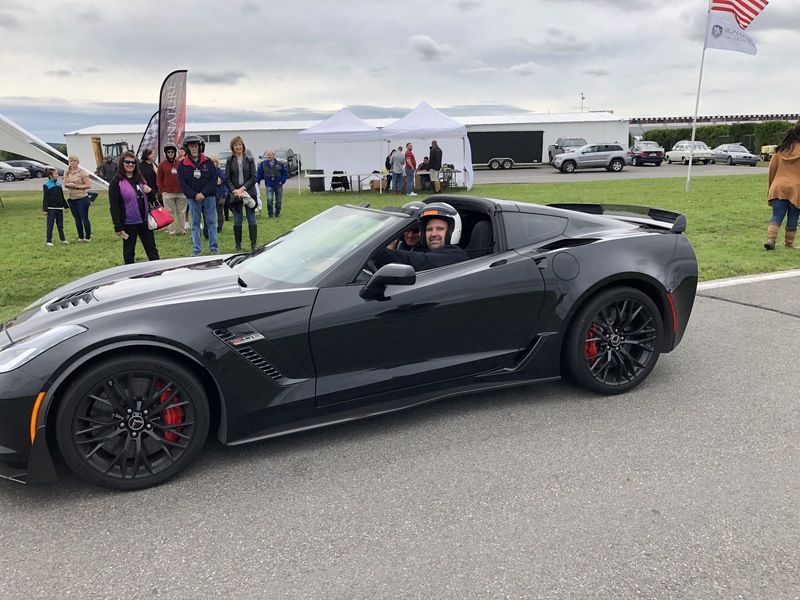 The new C7 ZR1 is not much quicker on the track even with more power. Last edited by DeaconBlue; 10-01-2018 at 02:10 PM. It stuck to the road like glue man. The handling is top notch. I can't see needing more power well at least on the course I drove on anyway. do you remember what track configuration they had you run? My daughter bought me the same package for Christmas this year, only out here in Northern CA. We did this at the Stockton Fair grounds parking lot. I drove a Ferrari all wheel drive twin turbo, I can't remember the name of the car but it was their top car. Did the same as you but coming out of the turn I would punch it hard right up to the next turn hit the brakes and hug the next turn. The guy told me, you're good at what you do but you're making the owner nervous so hit the brakes a little sooner, LOL!!! I wanted to see how that car handled in the turns, straight away was cool but I wanted to see handling. It did pretty good. So I did just that and on the forth lap he said I'm giving you two extra laps, because you're that good. He then asked how many laps did we do? I replied Four- Right answer! LOL It was cool! What a rush! Newb to the forums! and of course I have questions! Of course it's winter and no heat.